This is our really good looking Admiral. We don't know anything about its pedigree nor did we get a manual with it. However, if anyone has threaded a Singer, there are no surprises here. 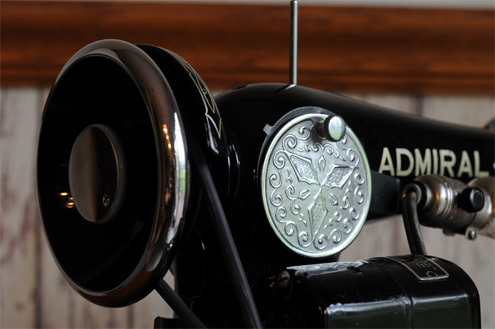 Elizabeth and her mom, Eileen, snatched this machine from a flea market in Clarence, New York during April 2008. They stored it in the car and Jim did not know about it until they got home. it was covered with dust and dirt, but shows very little sign of use. The bobbin case adjustment was as tight as would go and after adjusting it properly and installing a new 15x1 needle, it sews great. Serial number of this machine is M1031. To clean and oil the shuttle, a small finger knob in the upper-right corner is rotated releasing the hold-fast plate. 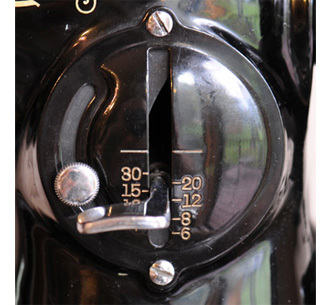 When inserting the bobbin, the finger must rest in the detent as shown. The above image shows the attractive access plate on the machine's rear. The plate is removed to provide access to lubrication points inside. 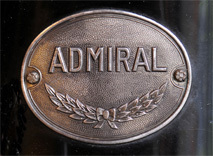 This Admiral has an attractive faceplate. It is held in place by a single screw. Threading is a bit awkward as the upper thread tension and take-up arm are situated on the rear of the machine. However, threading is similar to that of Signers poplar at the same time period. 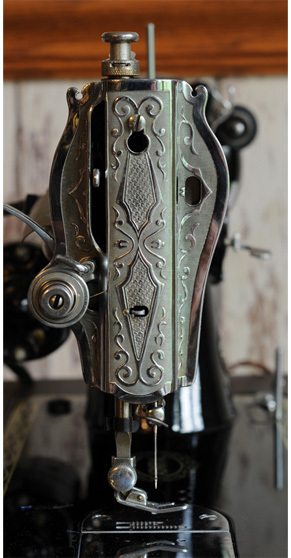 Stitch length and forward/reverse are controlled by this lever. 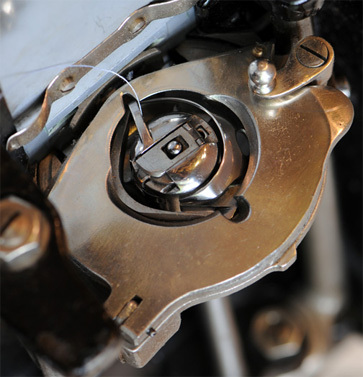 When an internal disk is secured with the screw, forward and reverse stitch length will be the same length. This machine was made in Japan. 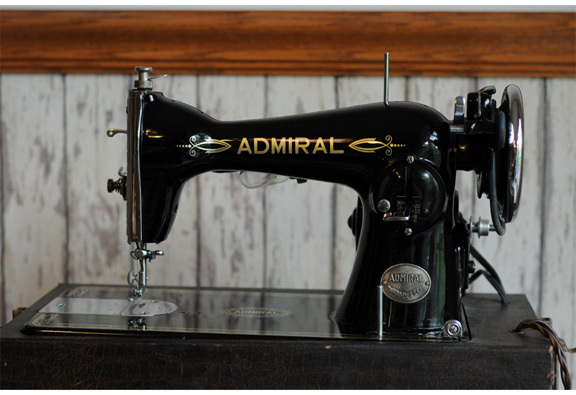 It is either a copy of a familiar Singer machine, or a machine sold under a common name probably at a department store.